I picked up this Real Photo Post Card to add to my 83rd Collection. 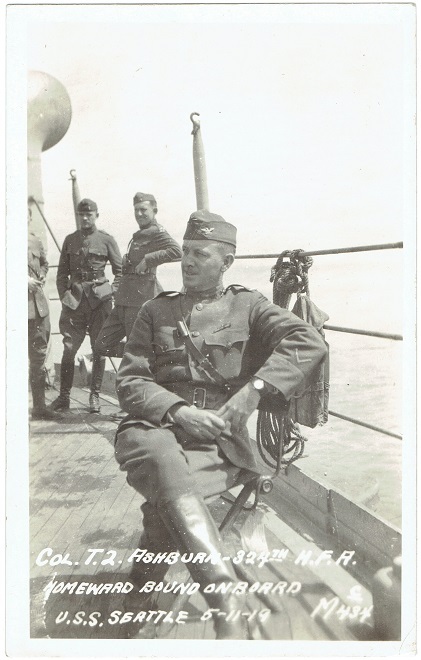 This RPPC pictures Colonel Thomas Quinn Ashburn, Commander of the 324th Field Artillery on his way back to the U.S. on board the USS Seattle. He had a long and distinguished career, eventually rising to the rank of Major General. He earned the Distinguished Service Cross and Croix de Guerre and was wounded while acting as Commander of the 324th F.A. This establishes him as a "lead-from-the-front" kind of Commander, he must have been a pretty tough customer and the kind of leader you would want to follow. THOMAS QUINN ASHBURN was born in Batavia, Ohio, November 17, 1874, the son of Dr. Allen Wright and Julia (Kennedy) Ashburn. Both of his parents were natives of Ohio. 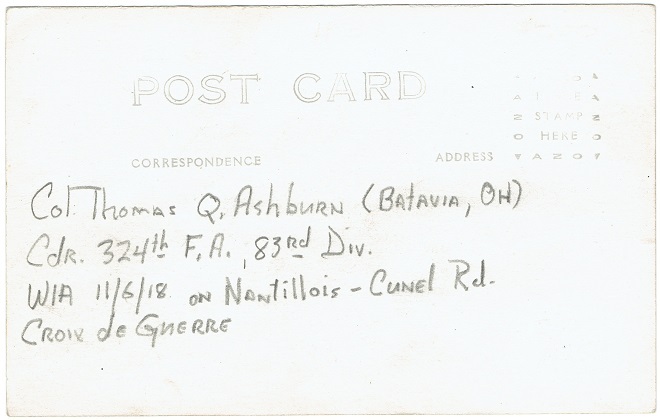 Thomas Ashburn attended the public schools, including the High School of Batavia, Ohio, and Braden’s Preparatory Academy, Highland Falls, New York, before he entered the United States Military Academy at West Point as a cadet from Ohio in June, 1892, graduating in June, 1897. Upon the expiration of his graduation leave, Ashburn joined the 25th Infantry at Fort Missoula, Montana. The following year, just prior to the outbreak of the Spanish-American War, he transferred to the artillery. However, in July, 1899, he accepted a captain’s commission in the 33rd United States Volunteer Infantry and soon after sailed with that regiment for duty in Manila. While serving in the Philippines, he participated in General Wheaton’s Expedition to Lingayen Gulf; as a Major, he fought at Bacooc, at Licuan, and, May 12-23, 1900, commanded one column in the pursuit of Aguinaldo. He was in engagements at Taguan, Dolores Road, San Gregoris Ford, and Dinguan. He was in the defense of Bangued in September, 1900, and helped repulse four other attacks launched by the Insurgents. He was recommended and nominated to the Senate as brevet major for "distinguished gallantry in action, November 11, 1899, at San Jacinto, P. I." During this first tour of duty in the Philippines, Ashburn, in addition to his combat duty, was Military and Civil Governor in the Province of Abra, Luzon, and also organized and commanded the Department of Police at Manila. Upon return to this country in April 1901, he was mustered out as a Major, and reverted to the rank of First Lieutenant, Regular Army. Shortly after he was promoted to the grade of captain and resumed his duties as an artillery officer. In 1901 and 1902, he was aide-de-camp to Major General Arthur McArthur but, early in 1902, sailed for Cuba, commanding the 18th, 19th, and 24th companies of Coast Artillery at Cienfuegas, Santiago and Rowell Barracks, and Havana, respectively. After his return from Cuba in 1903 until the outbreak of World War I, Ashburn’s duties were routine, but he graduated from the School of Submarine Defense in 1907 and served a second tour in the Philippines during the period. In 1911, he was promoted to the grade of major; 1912 found him a Lieutenant Colonel and in August of that year, a Colonel. He organized and commanded the 324th Field Artillery, which was part of the 83rd Division during World War One, and the 158th Field Artillery Brigade. 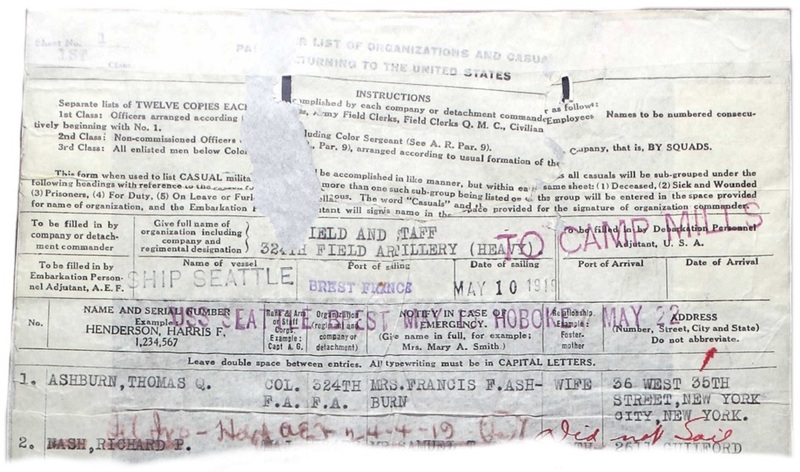 In June 1918, he sailed with his unit to France. While serving with the American Expeditionary Forces in France, he participated in the Meuse-Argonne Offensive and in the Occupation of the First Army Defensive Sector. During the Meuse-Argonne Offensive, September 26 to November 11, 1918, he commanded the 324th Field Artillery and the 158th Field Artillery Brigade, supporting during this time the 91st, the 29th, the 18th French, the 26th, and the 79th Divisions; rejoined the 32d Division, October 31, 1918, and remained with it until the Armistice and afterwards in the original Army of Occupation in Germany to April 24, 1919. 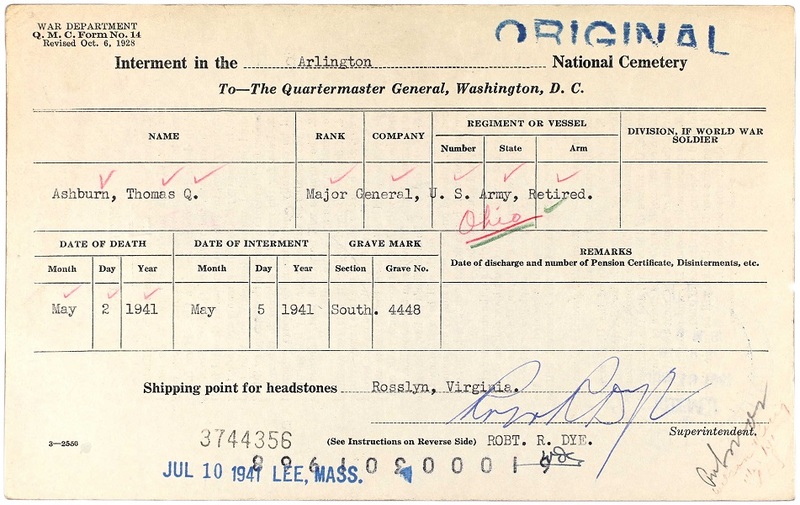 Upon his return to America in May, 1919, Ashburn’s duties were many and varied in connection with the demobilization of the army and the disposal of prisoners of war. In 1920, he became a Colonel, and Assistant and Chief, Inland and Coastwise Waterways Service at Washington, D.C. In 1924, he became a brigadier general and was made Chairman, Advisory Board, Inland Waterways Corporation at Washington, D.C. In 1927, he received another star. General Ashburn was one of the original promotors of the Inland Waterways Corporation which he had recommended and had had created by law. He made it a going and paying concern after becoming its head in 1924, and continued to serve as Chairman of the Advistory Board until his retirement from active duty in 1938. After retirement, he remained in this duty and, also, President of the Warrior River Terminal Company, until the latter part of 1939. He was awarded the Silver Star Medal with citation: "For gallantry in action against insurgent forces at San Jacinto, Luzon, Phillippine Islands, November 11, 1899". He received the Purple Heart for wounds received in action in France, November 6, 1918. He was commended publicly and personally by General Pershing, by Major General John L. Hines, commanding 3rd Army Corps, and, in a letter, by Major General William Lassiter, commanding the 32nd Division, for "excellent condition and results obtained in 158th Field Artillery Brigade, and especially the splendid appearance and obvious efficiency of the 324th Field Artillery." French Croix de Guerre and citation by General Gascouin, Chief of Artillery, 17th French Army Corps, he commanded his regiment with notable mastery during the offensives to the east of the Meuse, October 9-28, 1918. Mexican decoration and diploma of the Order of Military Merit, 1st Class. For services rendered during the World War he was recommended for the Distinguished Service Medal by division commander Major General E. F. Glenn and others, and was recommended at various times for appointment as Brigadier General National Army for meritorious service before and in the Meuse-Argonne Offensive. He was the author of the History of 324th Field Artillery and of numerous articles dealing with military matters, river transportation, fighting forest fires, and other subjects. He was a member of the International Navigation Congress of the World, American Society of Naval Architects and Marine Engineers, the Military Order of the Carabao, and the American Legion. He was expert Military Advisor before the Spanish Claims Commission; he established the first modern submarine mine system on our Pacific Coast and had adopted three changes in modern methods of submarine mining. As a cadet at West Point, Tom, as he was affectionately called by his classmates and intimate friends in the Army, was a genial companion and took an active part in class athletics, Hundredth Night and Color Line entertainments, and in the social life generally of the Corps of Cadets. He was devoted to the Military Academy and returned as often as possible to West Point for reunions with his classmates. Throughout his long service and distinguished career he was faithful to the high principles and traditions of the Military Academy, which were his standard "Duty, Honor, Country." General Ashburn was married on January 12, 1898, to Miss Frances Marshall Fee of Louisville, Kentucky. 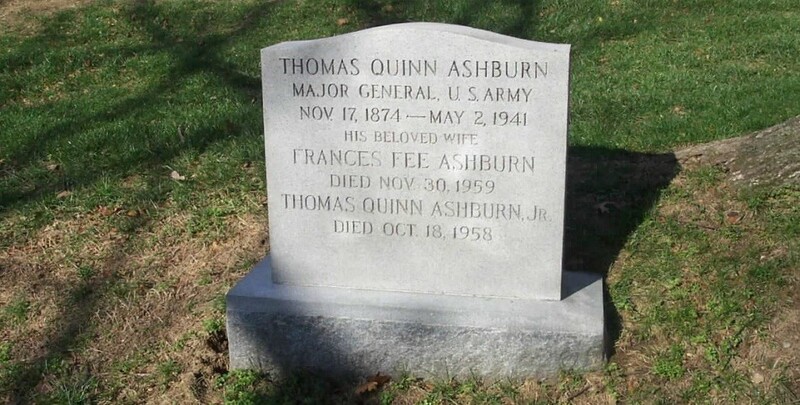 They had one child, Thomas Quinn Ashburn, Jr., who graduated from the United States Military Academy in the Class of 1925. His widow and their son survive him. A review of your record shows that throughout your military career yon rendered conscientious and loyal service to your country; and the efficient and highly competent manner in which you discharged your duties on various assignments of importance, including that of Chairman, Advisory Board, Inland Waterways Corporation, was most favorably commended by those with whom you served. You may well be proud of the record you leave in the Department, which record abounds in commendatory remarks bearing testimony to your ability and ardent devotion to duty. General Ashburn was buried with full military honors in beautiful Arlington Cemetery on May 5, 1941. Thirteen of his West Point classmates were among those who served as honorary pallbearers.